The latest available inflation rate for all countries world wide https://www.xpatulator.com/cost-of-living-article/Latest-International-Inflation-Rates_712.cfm (as available on 8 October 2018). Singapore is the most expensive city in the world for an expatriate professional migrant to live in as at October 2018, followed by Luanda and Hong Kong. An expatriate is a “professional migrant”, someone who voluntarily lives outside their country in order to take up a job opportunity and a better or at the very least a similar, quality of life. An expatriate professional migrant is different to an immigrant in that they intend returning to their home country and do not therefore consider themselves to be local in their host country. 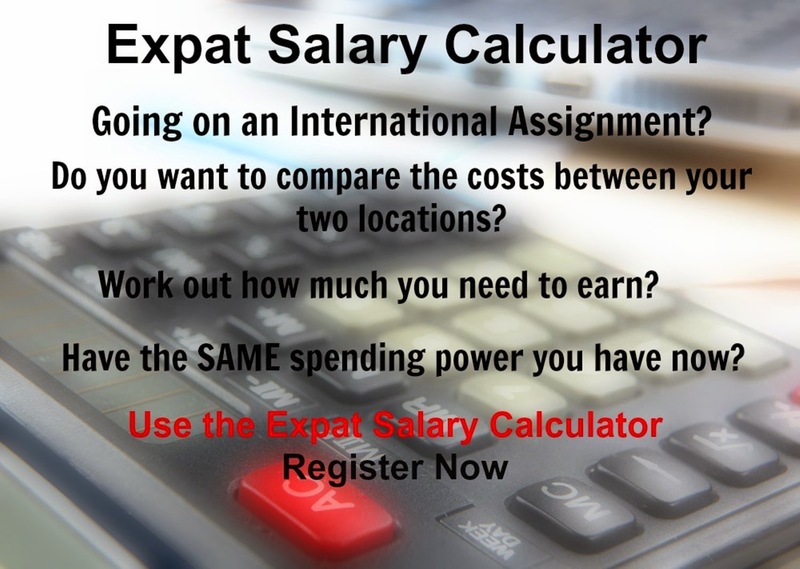 Xpatulator.com has been created to calculate expatriate pay using online calculators and an extensive database of cost of living and hardship indexes, for 780 international locations. The database is updated quarterly. Aruba is progressive up to 58.95%. Bahamas is 0% as there is no personal income tax. Belgium is progressive up to 50%. Brazil is progressive up to 27.5%. Gibraltar is a flat rate of 20%. Hungary is a flat rate of 15%. Israel is progressive up to 50%. Lebanon is progressive up to 20%. Netherlands is progressive up to 51.95%. Russia is a flat rate of 13%. Singapore is progressive up to 22%. United Kingdom is progressive up to 45%. Zimbabwe is progressive up to 50%. Selected latest available inflation rate for all countries world wide as at 27 August 2018: Angola 21.47%, Cyprus 2.3%, France 2.3%, Iran 18%, Japan 0.9%, New Zealand 1.5%, Qatar o.2%, South Africa 5.1%, UAE 3.8%, UK 2.5%, USA 2.9% Venezuela 82,766%. Click on the link for all countries latest inflation rates. 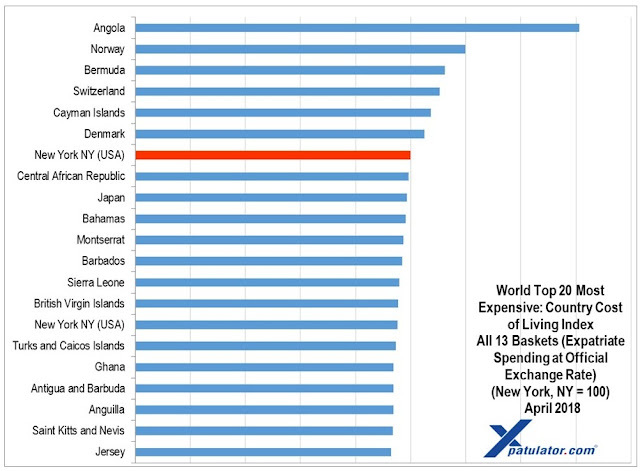 The top 10 most expensive countries in the world as at July 2018 comprise two from Africa Angola (1); Central African Republic (7), three from Europe Norway (2); Switzerland (3); Denmark (5), four from America Bermuda (4); Cayman Islands (6); Montserrat (9); Bahamas (10), and one from Asia Pacific Japan (8). Angola is the most expensive country in the world for expatriate professional migrants mainly because almost all international standard goods and services have to be imported, as a result there are price premiums due to demand constantly exceeding supply. Norway has long been very expensive and interestingly is the only oil-producing country with high gas prices. The 10 most expensive cities in the world comprise two from Africa, Luanda (1); Bangui (9), three from Asia-Pacific, Singapore (2); Hong Kong (3); Tokyo (7), four from Europe, Oslo (4); Zurich (5); Geneva (6); Monaco (10), and one from America, Hamilton (8). Jerusalem in Israel is the most expensive city for expats in the Middle East as at July 2018, followed by Doha in Qatar. Oslo has overtaken Zurich to become Europe's most expensive and the world's 4th most expensive city, while Zurich has dropped to 2nd most expensive expat city in Europe and the 5th most expensive city in the world for expatriates as at July 2018. 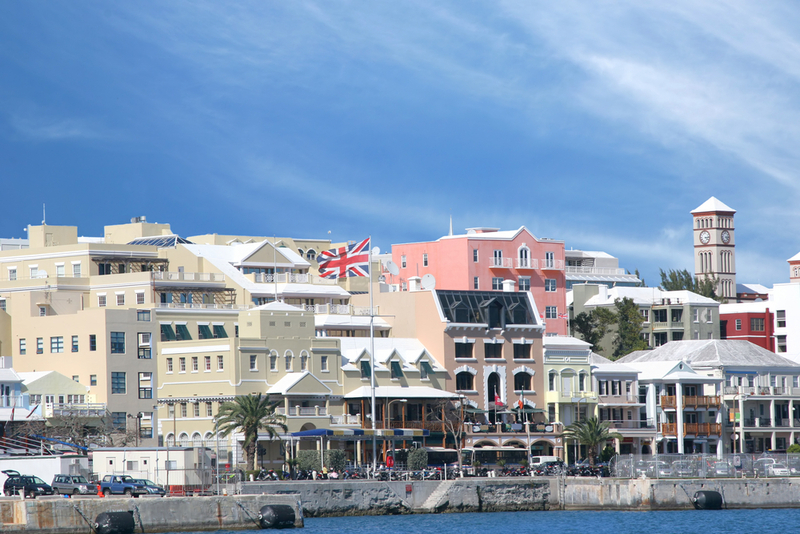 Hamilton, Bermuda is the most expensive location in the Americas as at July 2018, in 8th place globally, while Manhattan, New York is the second most expensive location in the Americas, the most expensive city in the USA in 11th place worldwide. The 2nd most expensive city in the USA is San Jose, California ranked 3rd in the region and 14th in the world. Luanda is the most expensive city to live in the African region, and world-wide as at July 2018 followed by Bangui in the Central African Republic, 2nd most expensive city in Africa, and 9th most expensive in the world. African countries are some of the poorest and least developed in the world, with relatively low local cost of living expenses; however the cost of importing and transporting the international standard of goods that expatriates expect to purchase in the cities in this region makes it extremely expensive to maintain the lifestyle that they are used to. 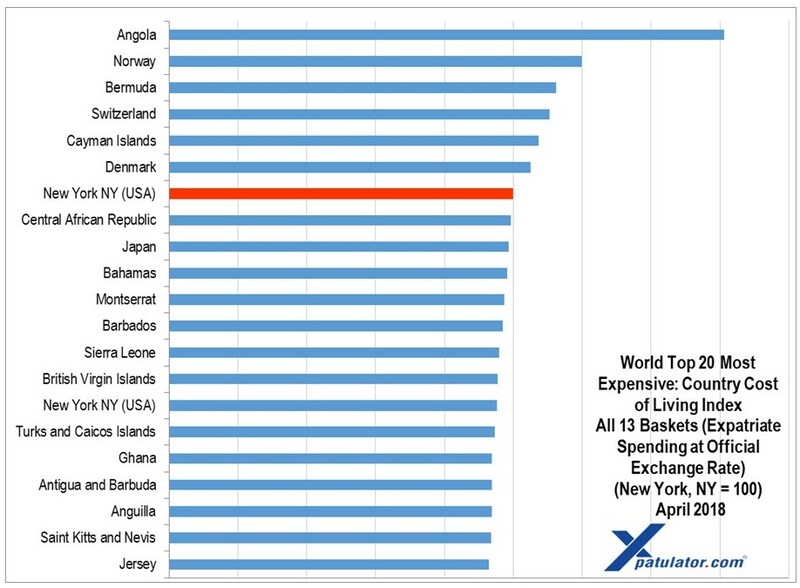 The top ten most expensive countries in the world as at July 2018 comprise two from Africa Angola (1); Central African Republic (7), three from Europe Norway (2); Switzerland (3); Denmark (5), four from America Bermuda (4); Cayman Islands (6); Montserrat (9); Bahamas (10), and one from Asia Pacific Japan(8). Norway has long been very expensive and interestingly is the only oil-producing country with high gas prices. High levels of taxation are applied to convince Norwegians to keep their cars at home and use public transportation instead. Almost everything in Norway is expensive compared to other countries. Angola is the most expensive country in the world while Luanda is the most expensive city in the world for an expatriate professional migrant to live in. Singapore is the most expensive city in the Asia-Pacific region for expatriates (2nd most expensive in the world), while Hong Kong is the 2nd most expensive city in Asia-Pacific and is 3rd most expensive city in the world as at July 2018. 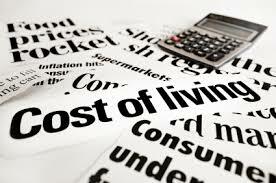 The secret to moving is to compare your expat salary offer with the cost of living. Take all aspects into account. At the end of the day although it may be an exciting adventure and a great learning opportunity, what you will earn, will determine the school, home, medical facilities and entertainment you will be able to afford. Your emotional stability and happiness in the new location are linked, like it or not, by how much money is sitting in your bank account. Afghanistan is progressive up to 20%. Albania is progressive up to 23%. Algeria is progressive up to 35%. Angola is progressive up to 17%. Antigua and Barbuda is 0%. Argentina is progressive up to 35%. Armenia is progressive up to 36%. Austria is progressive up to 55%. Australia is progressive up to 45%. Azerbaijan is progressive up to 25%. Bangladesh is progressive up to 30%. Barbados is progressive up to 33.5%. Belarus is a flat rate of 13%. Belize is a flat rate of 25%. Benin is progressive up to 35%. Bhutan is progressive up to 25%. Bolivia is a flat rate of 13%. Bosnia and Herzegovina is a flat rate of 10%. Botswana is progressive up to 25%. Selected latest available inflation rates for all countries world wide (as available on 3 May 2018). 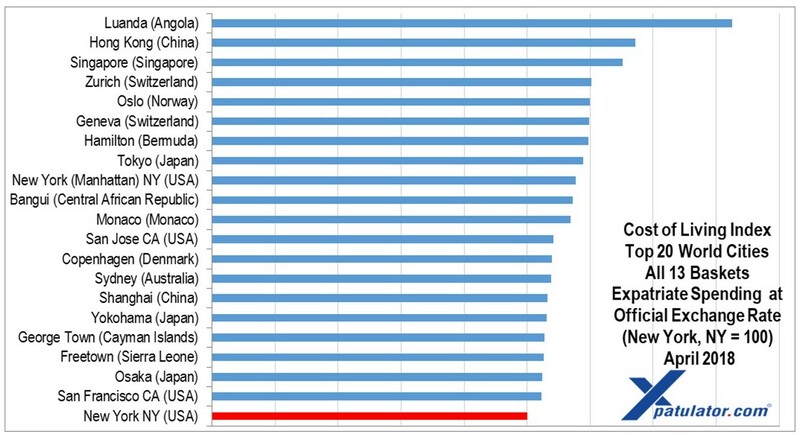 Jerusalem in Israel is the most expensive city for expats in the Middle East as at April 2018, followed by Doha in Qatar. Luanda in Angola is the most expensive city in the world for an expatriate professional migrant to live in as at April 2018, followed by Hong Kong and Singapore. The top ten most expensive cities in the world comprise two from Africa, Luanda (1); Bangui (10), three from Asia-Pacific, Hong Kong (2); Singapore (3); Tokyo (8), three from Europe, Zurich (4); Oslo (5); Geneva (6), and two from America, Hamilton (7); Manhattan NY (9). Notably, no city in the Middle East is ranked in the top 10 most expensive cities in the world. Luanda is the most expensive city to live in the African region, and world-wide as at April 2018 and is likely to get more expensive before it gets cheaper. In Africa, Luanda is followed by Bangui in the Central African Republic, and Freetown in Sierra Leone. Growth in Angola should reach 5 percent in the medium-term according to Ricardo Velloso, IMF division chief for Africa. This will likely further increase the demand for premium skills, goods and services, which are already in short supply. To meet the demand for high-level skills there will be an increase in the number of expatriates deployed in Angola in the coming years to help build infrastructure and expand oil production and related industries and services. In the short-term, we expect higher demand for expatriate premium goods and services in Angola to lead to higher prices on top of the already high prices for imported goods and services. Do not expect Angola to drop out of the most expensive places list anytime soon. The cost of living for expatriates in Hong Kong as at 1 April 2018 is very high in comparison to other places in the world. Hong Kong is for example 85.9% more expensive than Houston TX for groceries, 337.5% more expensive for household costs than Kuala Lumpur, and 52.1% more expensive for transport costs than Dubai. The economy of Hong Kong is characterised by the principle of "one country, two systems", whereby Hong Kong runs on economic and political systems different from those of mainland China. Hong Kong is one of the world's leading international financial centres, with a major capitalist service economy characterized by low taxation, free trade and minimum government intervention under the ethos of positive non-interventionism. Hong Kong is the overall most expensive city in Asia-Pacific and is the second most expensive city in the world (after Luanda) as at April 2018. Singapore remains the second most expensive city in the Asia-Pacific region for expatriates (3rd most expensive in the world) and tops the region rankings when costs related to housing, education, medical and transport are excluded. 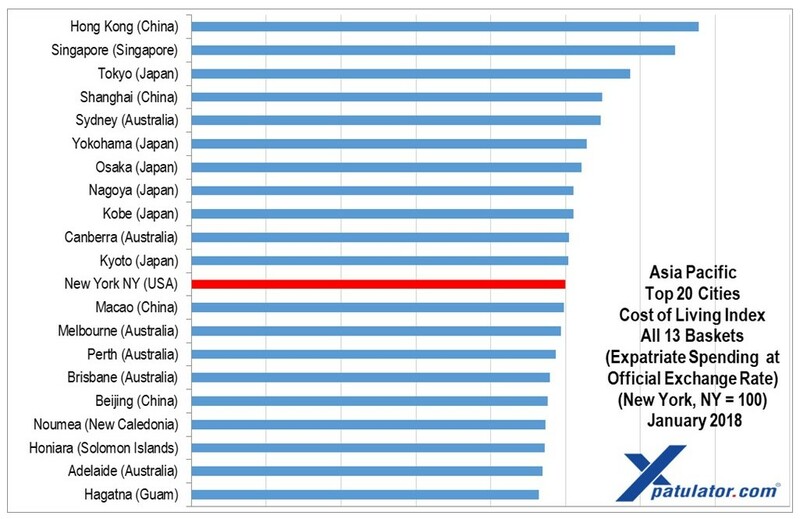 Tokyo is the third most expensive city in Asia-Pacific, and 8th globally. Japanese locations have remained high in the rankings with 6 cities in the Asia-Pacific top 10 most expensive places. The cost of living for expatriates / professional migrants in Singapore as at 1 April 2018 is very high in comparison to other places in the world. Singapore remains the second most expensive city in the Asia-Pacific region for expatriates (3rd most expensive in the world) and tops the region rankings when costs related to housing, education, medical and transport are excluded. Singapore's education system, which is widely regarded as the best in the world, is also the most expensive for expatriates when priced in US Dollars, the cost of housing is also extremely high due to the limited space and premium on high quality expatriate accommodation, while the complex Certificate of Entitlement system makes car prices excessive, resulting in Singapore’s transport costs being among the highest in the world. Hamilton in Bermuda is the most expensive location in the Americas as at April 2018, in 7th place globally; this is due to the high price of property and the fact that most items have to be transported to Bermuda adding a great deal to the cost of expatriate items. New York (Manhattan) NY is the second most expensive location in the Americas, the most expensive city in the USA in 9th place worldwide, this is mainly due to the highly priced rental property market. The second most expensive city in the USA is San Jose CA ranked 3rd in the region. 3.1% for Afghanistan as at November 2017. 2.1% for Albania as at February 2018. 3.01% for Algeria as at January 2018. 21.47% for Angola as at February 2018. 3.1% for Anguilla as at 2014. 1.4% for Antigua and Barbuda as at 2012. 25.4% for Argentina as at February 2018. 3.3% for Armenia as at February 2018. 1.1% for Aruba as at January 2018. 1.9% for Australia as at December 2017. 1.8% for Austria as at February 2018. 4.7% for Azerbaijan as at February 2018. 1.8% for the Bahamas as at December 2017. 3.1% for Bahrain as at February 2018. 5.83% for Bangladesh as at December 2017. 3.4% for Barbados as at July 2017. 4.9% for Belarus as at February 2018. 1.39% for Belgium as at March 2018. 0.9% for Belize as at January 2018. 0.9% for Benin as at January 2018. 1.7% for Bermuda as at April 2017. 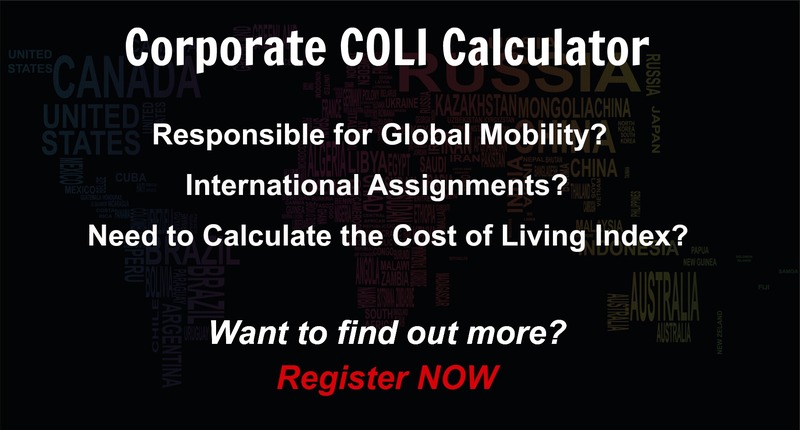 April 2018 international expat cost of living comparison rankings for world cities and countries. 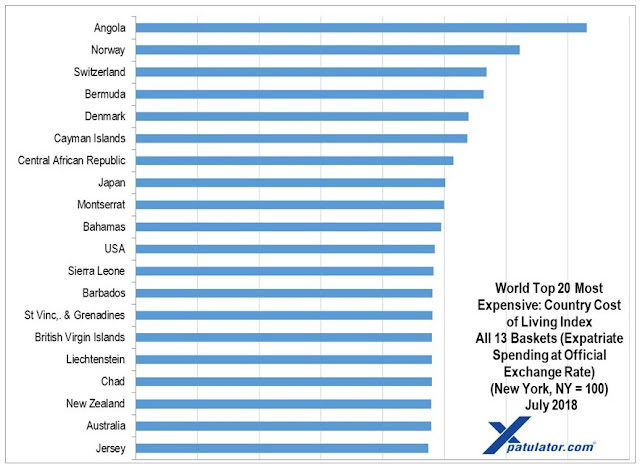 The top ten most expensive countries in the world as at April 2018 comprise two from Africa Angola (1); Central African Republic (7), three from Europe Norway (2); Switzerland (4); Denmark (6), four from America Bermuda (3); Cayman Islands (5); Bahamas (9); Montserrat (10), and one from Asia Pacific Japan (8). Angola is the most expensive country in the world for expatriate professional migrants mainly because almost all international standard goods and services have to be imported, as a result there are price premiums due to demand constantly exceeding supply. The extremely costly safe expatriate accommodation, imported produce and costly international private schooling are among the main factors that have kept Angola at the top of the world rankings. A rented house in a guarded community (recommended due to the threat of violent crime) can cost between US$8 000 and US$12 000 per month. Angola is unbelievably expensive, and it will get more expensive before it gets cheaper. Here is why. 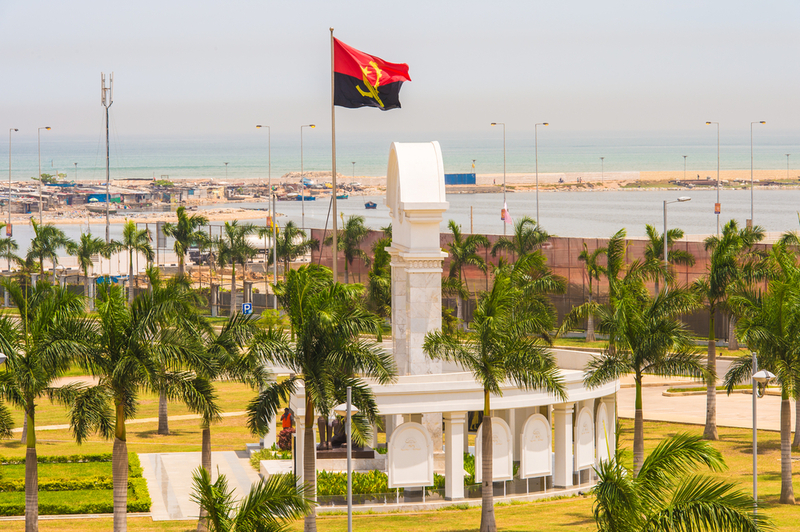 Angola’s new President Joao Lourenco has vowed to revive the economy, attract investment and combat the endemic corruption, and he is acting fast. Growth should reach 5 percent in the medium-term. The demand for expatriate goods and services in Angola has exceeded supply since the dawn of peace after many years of economic stagnation despite immense oil wealth due to the post-independence civil war. By expatriate goods and services, I refer to international premium brands (food, clothing, and other consumables), international schools, excellent healthcare, and safe quality accommodation. Luanda is the most expensive city in the world for an expatriate professional migrant to live in as at April 2018, followed by Hong Kong and Singapore. The top ten most expensive cities in the world comprise two from Africa, Luanda (1); Bangui (10), three from Asia-Pacific, Hong Kong (2); Singapore (3); Tokyo (8), three from Europe, Zurich (4); Oslo (5); Geneva (6), and two from America, Hamilton (7); Manhattan NY (9). Hong Kong is the overall most expensive ciy in Asia-Pacific and is the second most expensive city in the world (after Luanda) as at January 2018, mainly due to extremely high housing costs, as well as high cost of schooling and limited space available making rentals high. 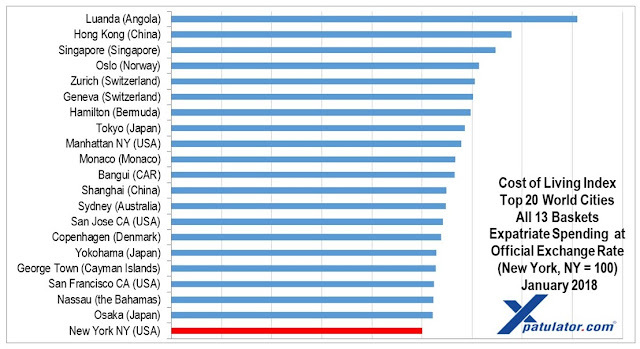 Tokyo is the third most expensive city in Asia-Pacific, and 8th globally. Japanese locations have remained high in the rankings with 5 cities in the Asia-Pacific top 10 most expensive places. Shanghai is the fourth most expensive place for expatriates in the Asia-Pacific region, and 12th globally. Luanda in Angola is the most expensive city in the world for expatriate professional migrants to live. As opposed to Hong Kong, everything in Luanda is expensive as almost all international standard goods and services are imported. Despite the lower oil price, the slow-down in oil related projects, and dramatic reduction in revenue to Angola in 2016, prices in Luanda remain extremely high. Hong Kong is the second most expensive city due to the very high cost of housing and healthcare, as well as the strong Hong Kong dollar which is fixed against the US Dollar. 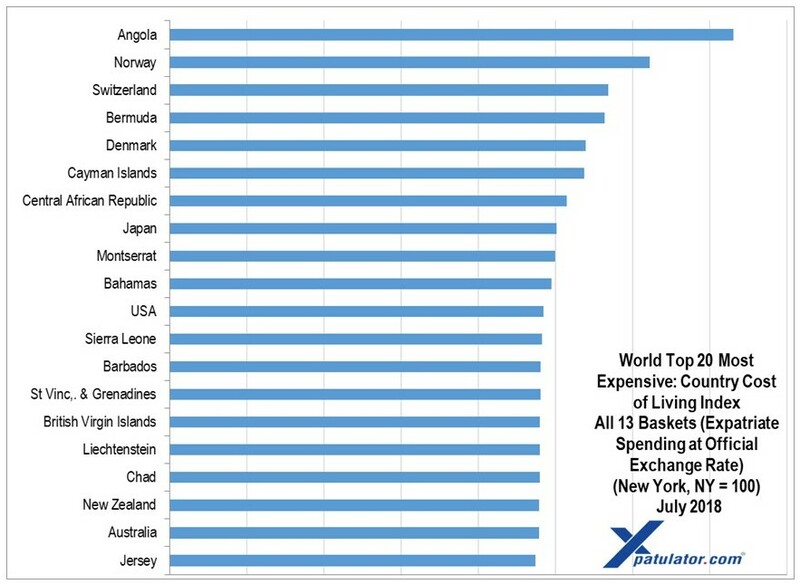 An interesting observation is the fact that if 4 of the 13 baskets are excluded from the cost of living index calculation (namely Housing, Education, Medical and Transport) then Hong Kong drops out of the top 10 most expensive cities in the world. This illustrates that not everything in Hong Kong is expensive. 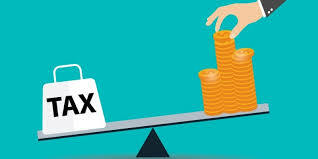 It is therefore very important it is to ensure that the correct baskets are included in an expat cost of living index. Doha in Qatar is the most expensive city for expats in the Middle East as at January 2018, followed by Beirut in Lebanon, and Jerusalem in Israel. While Doha is the most expensive city in the Middle East, it is only ranked 59th in the world. In Doha alcohol, housing, and education costs are very high. The latest available inflation rate for all countries world wide (as available in 15 February 2018): Afghanistan 3.1% (Nov 2017). Antigua and Barbuda 1.4% (2012 est). Bosnia and Herzegovina 1.2% (Dec 2017). British Virgin Islands 2% (Nov 2016). Oslo is Europe's most expensive and the world's 4th most expensive city, leapfrogging past Zurich and Geneva. Zurich and Geneva are ranked as the second and third most expensive expat cities in Europe and the 5th and 6th most expensive cities in the world for expatriates as at January 2018. This is due primarily to the strong Swiss Franc as well as due to high rentals and institutionalized high wages. 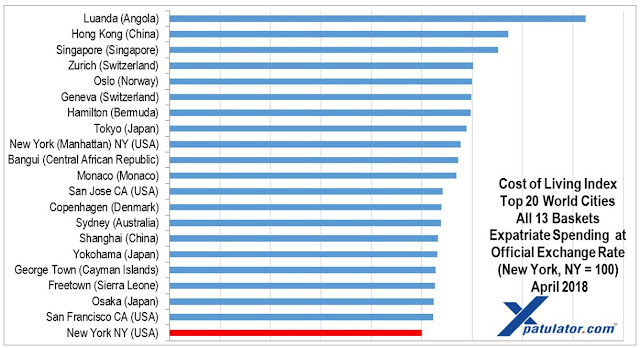 An interesting observation is that the most expensive cities in Europe are dominated by Non-Euro countries. Luanda is the most expensive city in the world for an expatriate professional migrant to live in as at January 2018, followed by Hong Kong and Singapore. The top ten most expensive cities in the world comprise one from Africa, Luanda (1), three from Asia-Pacific, Hong Kong (2); Singapore (3); Tokyo (8), four from Europe, Oslo (4); Zurich (5); Geneva (6); Monaco (10), and two from America, Hamilton (7); Manhattan NY (9). As opposed to Hong Kong, everything in Luanda is expensive as almost all international standard goods and services are imported. Despite the lower oil price, the slow-down in oil related projects, and dramatic reduction in revenue to Angola in 2016, prices in Luanda remain extremely high. Hong Kong is the second most expensive city due to the very high cost of housing and healthcare, as well as the strong Hong Kong dollar which is fixed against the US Dollar. 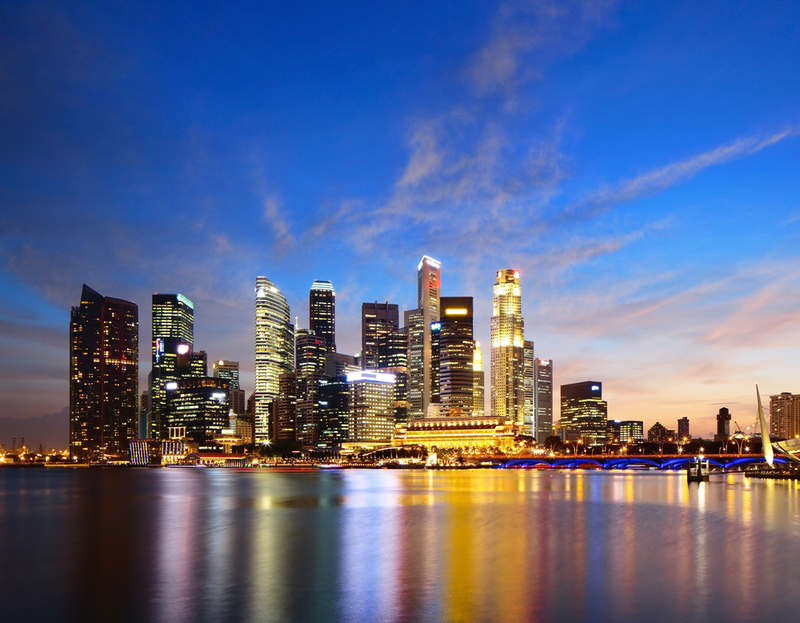 Singapore is the third most expensive city in the world for Expatriate’s to live. Singapore's education system, which is widely regarded as the best in the world, is also the most expensive for expatriates when priced in US Dollars, the cost of housing is also extremely high due to the limited space and premium on high quality expatriate accommodation, while the complex Certificate of Entitlement system makes car prices excessive, resulting in Singapore’s transport costs being amongst the highest in the world.